This week I had the pleasure of spending a morning birding at the St. Sebastian River Preserve State Park, which is located in Central Florida. I decided to explore the two northern quardents via Buffer Point Drive. To one side, the drive parallels the berm of a waterway. The other side is landscaped by Longleaf pines and wiregrass/saw pamettos. This open grassy forest supports many other communities of habitats as well. My last visit here was back in January, which was quite a bit different from today's visit. American Kestrels heavily populated the park at that time, with not a single one in sight today. Just before reaching the entrance, I spotted a Northern Bobwhite meandering along the side of the road. 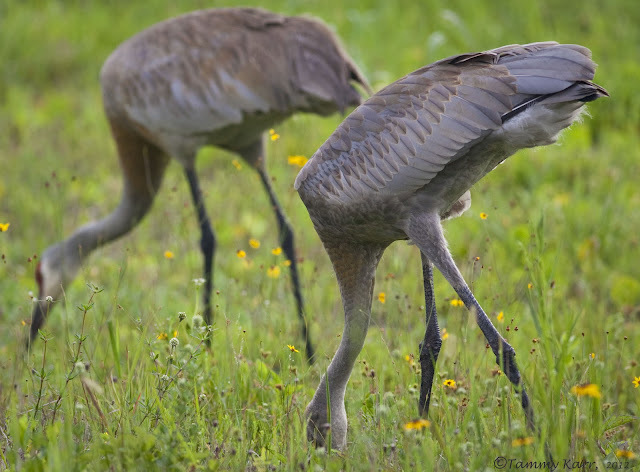 I was greeted at the entrance of Buffer Preserve Drive by a family of Sandhill Cranes foraging together through the wet grass. I watched them for a short time as I listened to several Eastern Meadowlarks singing from a nearby perch. Before heading off down the drive, I spoke to the park ranger to see if he had any tips for seeing the Red-cockaded Woodpeckers that reside here. He notified me that they would be having a prescribed burn today, so the trails would not be accessible. My best bet would be to scan the marked trees that are visible from the road. 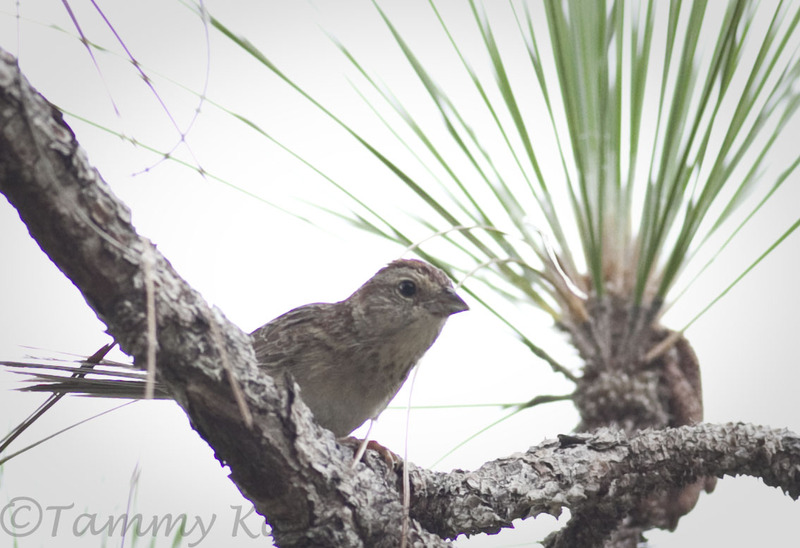 Despite the trails being closed, I was still able to see a great variety of birds along the drive. The first raptor I encountered was a Red-shouldered Hawk in a Pine. The hawk was being harassed by a unhappy Mockingbird! 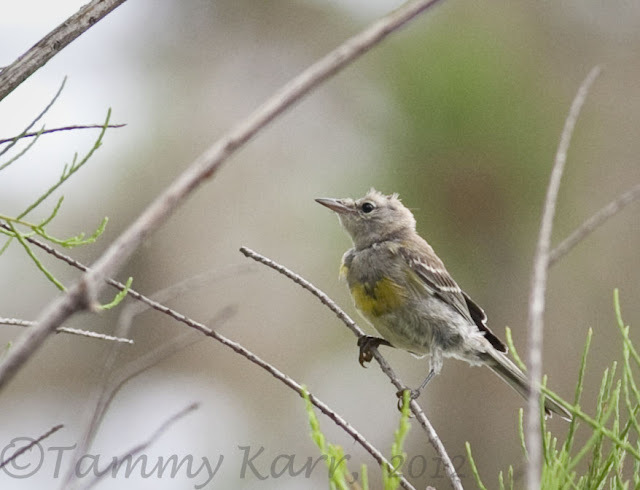 A little further along, I came upon several Pine Warblers, a few females/ immatures, as well as one male, foraging, where else, but in the Pines! As I observed the Pine Warblers, I heard some commotion being caused by a pair of Great Crested Flycatchers. I caught this one dropping down at full speed from a branch to join its mate in a bug hunt upon a brightly colored bush. Apparently this one spotted something it was in a hurry to catch! 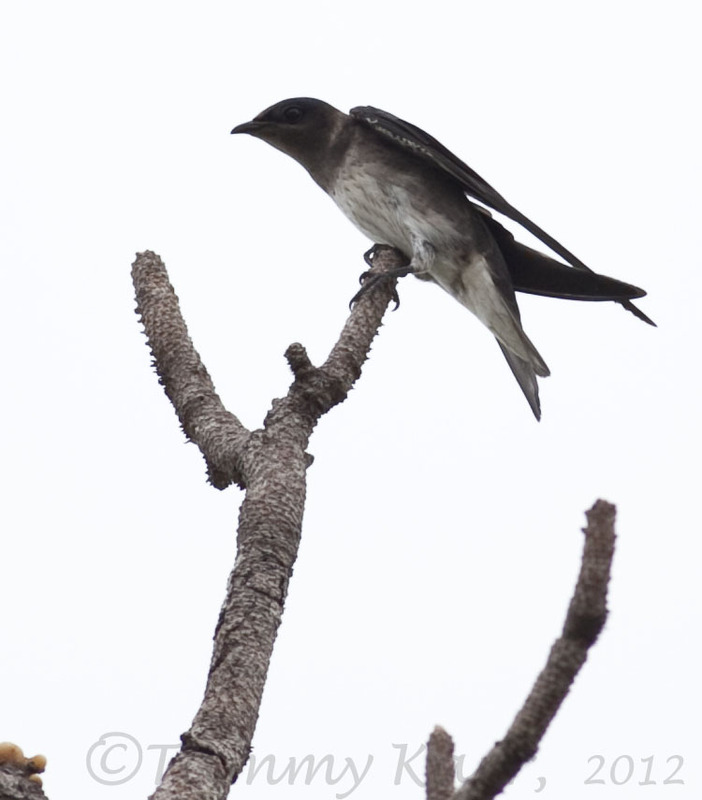 As I continued along, I noted a baron tree, decorated with a dozen resting Purple Martins. These large swallows are spring/summer visitors. I also saw several Barn Swallows throughout the drive. Swallow-tailed Kites are also common visitors in the spring and summer. I spotted one Swallow-tailed Kite patrolling the area from the sky, which is where the kites spend the majority of their time. As I approached the end of the drive, I saw some trees marked to indicate they are occupied by nesting Red-cockaded Woodpeckers. I didn't observe any woodpeckers coming or going from these trees. 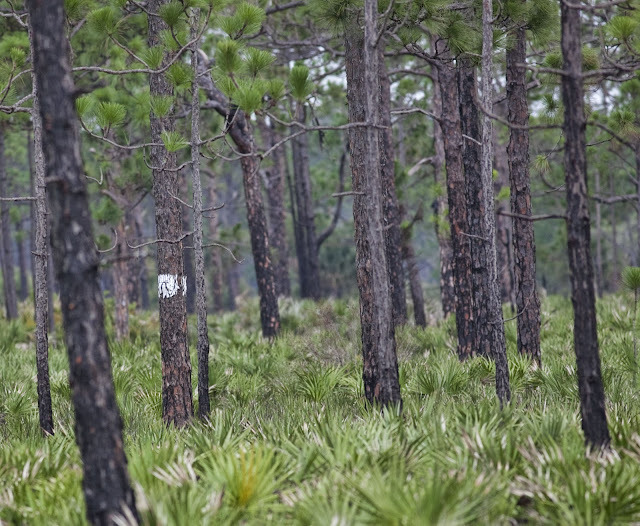 There are only a handful of the trees visible from the road, the rest are only visible from the trail. The next area I stopped at was the parking area for the trail head. 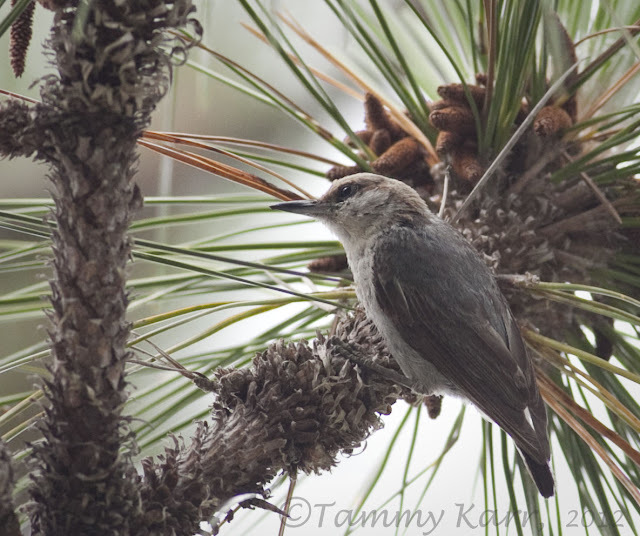 Brown-headed Nuthatches were foraging along the branches of the Pine trees. 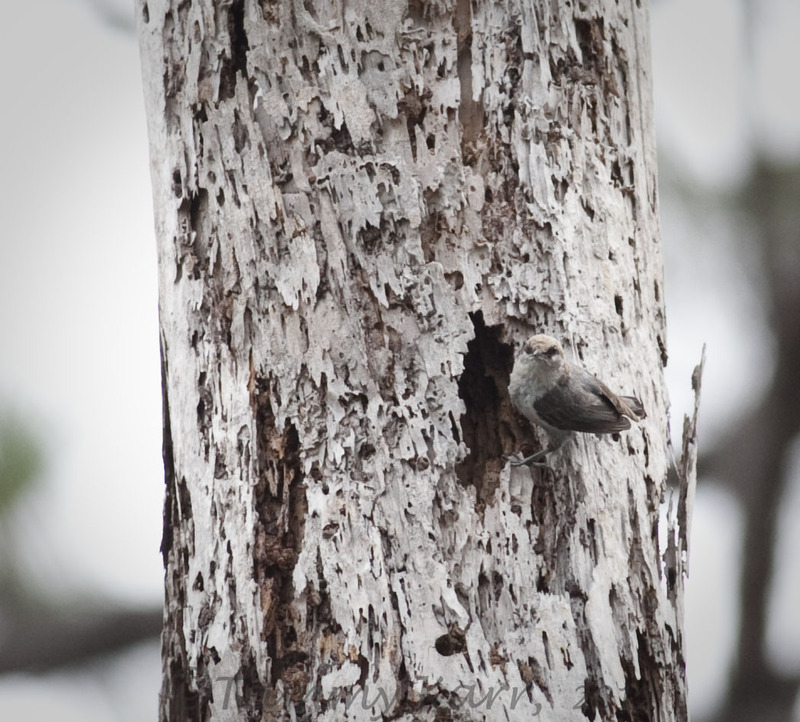 In addition to the Red-cockaded Woodpeckers, the Brown-headed Nuthatches also dwell in the Pine woodlands habitat. The Nuthatches are quite amusing to watch, as they twist around the branches of the tree while foraging. 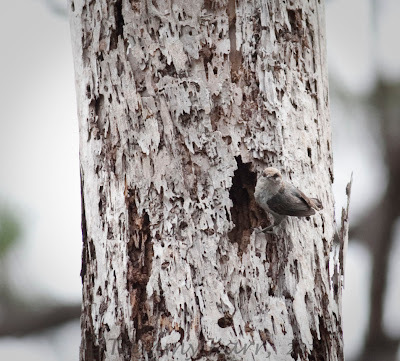 While Nuthatches forage on live Pines, they nest in standing dead trees. I happened to see one coming and going from this cavity. I also saw this Nuthatch fledgling eagerly awaiting a meal from its parent. 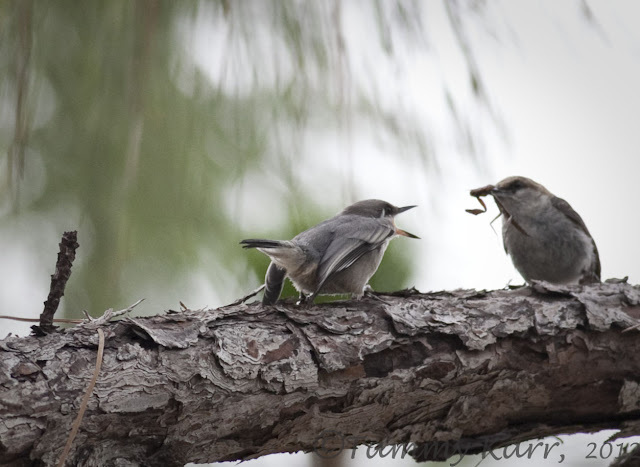 In close proximity to the Nuthatches, were several more Pine Warblers, including these two juveniles. A lone young Bachmann's Sparrow was also seen in this vicinity. These sparrows reside year-round at the park. The drive ends at an overlook of the St. Sebastian River. In the winter, this is a very popular place for manatees to congregate. However, since it isn't the slightest bit cold here, there were no manatees. I did see three Wild Turkeys walking along the bank though. I will continue my quest to see a Red-cockaded Woodpecker on my next visit, which I hope will be very soon! 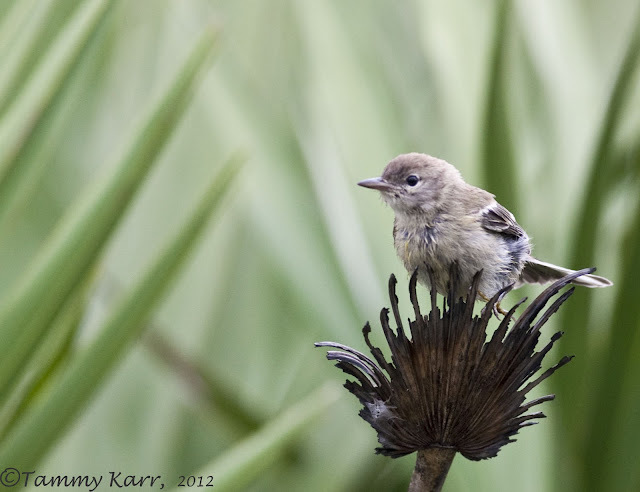 Wow Tammy, you do get some sume incredible birds over there, and you take incredible pictures of them!! ...really enjoyed this post, Tammy. 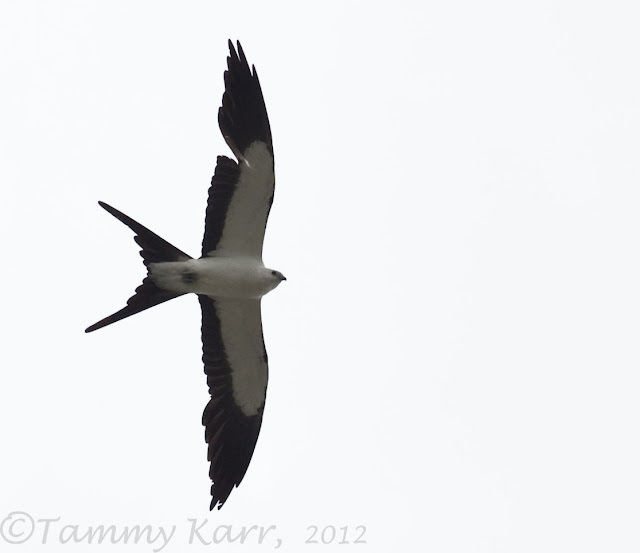 The "bombs away" photo made me smile, and I loved seeing the Swallow-tailed Kite photo!! 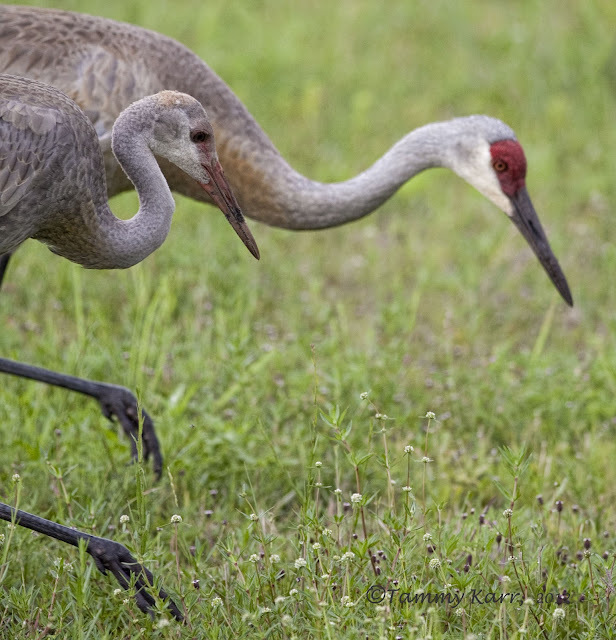 Wonderful seeing the Sandhill Cranes up close too! I've never seen a Brown-headed Nuthatch...cute!! Very cool Tammy. Bummer about the absent Red-Cockaded Woodpeckers but hey, Swallow-tailed Kites, Purple Martins, Sandhill Cranes...pretty darn good stuff! thanks for sharing this with us! i really like the layers of feathers on those cranes. really beautiful. and that dive-bombing flycatcher is wonderful! Beautiful captures, Tammy. Your stunning photos always amaze me. Thank you for sharing the beauty. This looks like a lovely area to visit! I might have to take a drive over there during my next Florida visit. Your photographs are wonderful, as always! 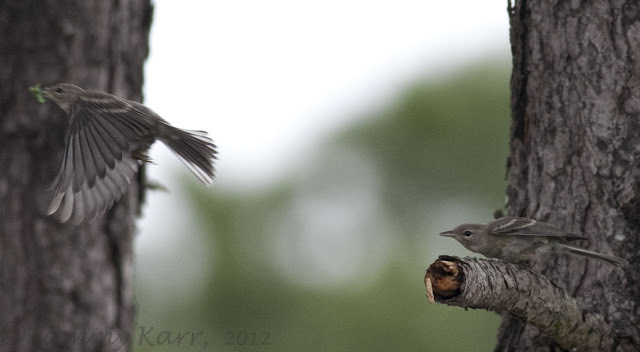 The dive bombing Great-crested Flycatcher shot is fabulous. I also love the beautiful Sandhill Cranes. Sweet, scruffy Pine Warblers and awesome in-flight Swallow-tailed Kite capture. Fantastic post, Tammy! Wonderful series. Your outing at St. Sebastian River Preserve was quite productive and by the looks of things... fun too! 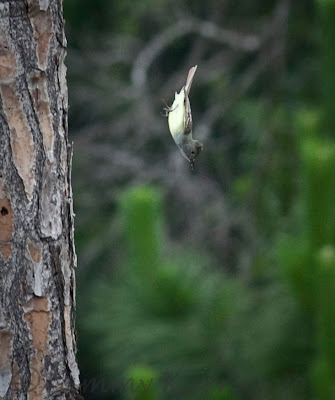 The action shot of the diving Flycatcher is extraordinary! Wow Tammy, Great photos! Many of these capture the action and motion of the birds well with so little blur...really impressive. Thanks again for your advice on Florida birding spots!